"Geo-Me!" uses animated musical stories and adorable avatars to introduce kids to basic world geography. "Great graphics and catchy, educational tunes round out this highly recommended app." "Geo-Me! does a great job of introducing basic geography to students by engaging all of their senses and imagination. 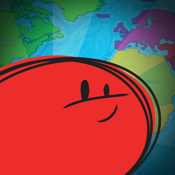 The world in an app has never been so fun and personal." "Highly engaging geography and world cultures exploration on this interactive app. The Geo-Me characters add an element of whimsical fun, while the well-designed, distinct maps incorporate concrete learning." "Each character takes your child on a musical journey to discover their corner of the planet and because the music is catchy, the lessons are likely to stay with children a lot longer than if learned in a classroom... Everything is seamlessly integrated and polished earning Geo-Me! the appoLearning Seal of Approval." "In addition to the endearing avatars and gorgeous animation, the other main plus of the app is the music...We love apps that captivate a child’s imagination – and even more so when they are educational too. Geo-Me! is just such an app." "Overall, Geo-Me! is an original concept that does a great job of introducing kids aged 6+ to basic geography in a fun and engaging way. With amazing graphics, a catchy theme song, and a low price of only $0.99, you should definitely give it a try." *Featured as "New and Noteworthy" by the App Store! *Featured on The iPhone Mom's "Ten For Tuesday"
• Unlock animated musical stories of children from around the world! • Have fun creating Geo-Me's of your own with the "I'm a Geo-Me!" Builder! • Let each Geo-Me lead you to a new place on the world map! • Get to know the geography and demography that makes life in a certain place unique from (and similar to) your own! • Choose your favorite characters to make your own version of the song "Where I Am"– the musical engine of the whole experience! Lost of music and animation for younger kids, and plenty of cool map stuff for older kids. In version 1, we introduce the first 6 characters in the "Geo-Me!" world, with more characters and activities ready to join them in the very near-future. We'd love to hear what you think! ENJOY IT NOW, AND WATCH THE "GEO-ME!" WORLD GROW! Check out the FREE "Geo-Me! Try-Me!" to see what it's all about! Crackerbox is a very small group of passionate artist/technicians. Our animated titles are completely home-grown, and we are just starting on our long journey. Our goal is to create an experience that is somewhere between a game and a musical, interactive book. No points. No power-up. Just promoting curiosity, which is where all learning comes from. With our first collaboration, "Geo-Me! ", we were not interested in presenting cliché costumes and cultures, and we knew that there were enough puzzles of land masses and quizzes of capitals out there already. Our single hope is to create an entertaining window in to a subject, with songs and characters that a child will remember their whole life, and through that provide a simple "light bulb moment" for a small person. And what better place to start off doing that than while exploring our great big globe! *"Geo-Me!" asks to use the iPad's geolocation data to create the user's Geo-Me. No personal information is stored or transmitted.